I didn't get around as early as I had wanted to this morning, but we still managed to get Keaton off to school on time and the rest of us started school a bit after 8. If you would have asked me a few months ago how Keaton would have felt about school, I really would have thought she would not be too excited about it. But I would have been very, very wrong. Keaton loves school and throws on her clothes as fast as she can so her and Robby can get out the door. When she brings papers home from school (even if they are just information papers-like bring a picture of the family) she sets them beside her bed up against the wall. School here was fine today and I will take "fine" any day. I had told the kids to get a move on because we were going to stop at 11:30. And surprisingly they did, everyone was finished by 11 and this gave me time to clean up and get a few things ready for tomorrow and our next day of school. Then we had our lunch and worked on a few chores. Graham had time to paint his boat that he had made out of wood-about the 20th coat of paint that he and Campbell have put on it. 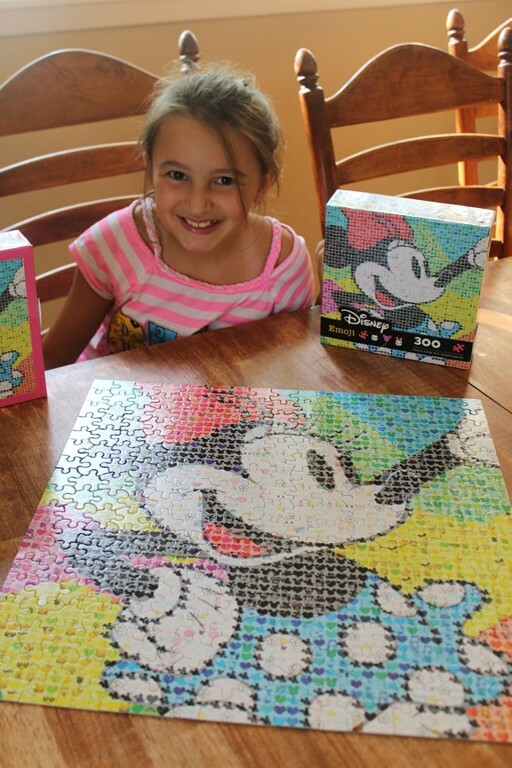 Reagan also worked on and finished her puzzle. Once it was done, she wanted to take it up to the bonus room. That girl was a nervous wreck as I carried that puzzle up the stairs. We then played a round of kickball at Grannymom's house before we headed home. Again this afternoon we really didn't do anything and it sure was nice. The little girls helped me put labels on all of the boxes upstairs. Then Keaton threw a fit because I wouldn't let her sit in the attic with me and price garage sale stuff-the attic isn't a place for her and she would have objected to 100 percent of the things I was pricing. When Robby came home, we had more leftovers for supper-we could probably eat the same leftovers tomorrow. Actually, we will probably eat those same leftovers tomorrow. Keaton was so excited to show us her report from last week (we had seen it before) so then Campbell had to present hers to us. After this, we did a bit of Xbox playing. After most kids had their turns, Robby and I were 2 of the contestants on the Wipeout game and Robby decided that it was bedtime before I could pummel him! (It was really bedtime though). Tonight bedtime was times-40 minutes from pajamas to us walking down the stairs.